Using many simple models to better understand complex datasets. Using list-columns to store arbitrary data structures in a data frame. For example, this will allow you to have a column that contains linear models. Using the broom package, by David Robinson, to turn models into tidy data. This is a powerful technique for working with large numbers of models because once you have tidy data, you can apply all of the techniques that you’ve learned about earlier in the book. 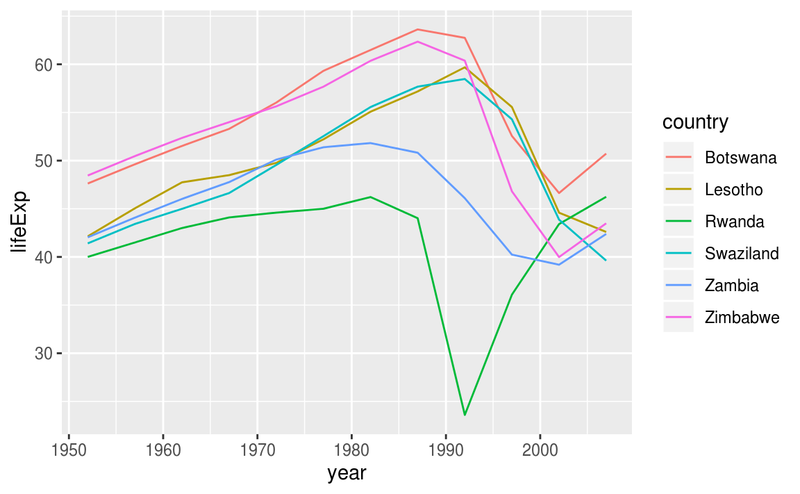 We’ll start by diving into a motivating example using data about life expectancy around the world. It’s a small dataset but it illustrates how important modelling can be for improving your visualisations. We’ll use a large number of simple models to partition out some of the strongest signals so we can see the subtler signals that remain. 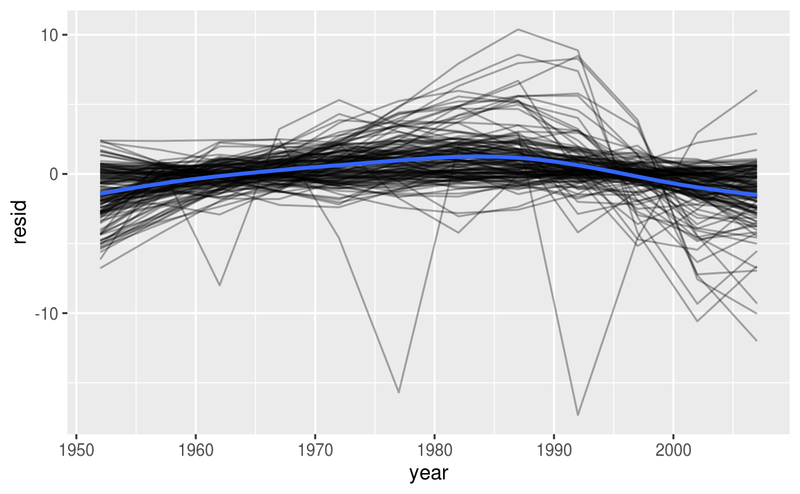 We’ll also see how model summaries can help us pick out outliers and unusual trends. In list-columns, you’ll learn more about the list-column data structure, and why it’s valid to put lists in data frames. In creating list-columns, you’ll learn the three main ways in which you’ll create list-columns. In simplifying list-columns you’ll learn how to convert list-columns back to regular atomic vectors (or sets of atomic vectors) so you can work with them more easily. In making tidy data with broom, you’ll learn about the full set of tools provided by broom, and see how they can be applied to other types of data structure. This chapter is somewhat aspirational: if this book is your first introduction to R, this chapter is likely to be a struggle. It requires you have to deeply internalised ideas about modelling, data structures, and iteration. So don’t worry if you don’t get it — just put this chapter aside for a few months, and come back when you want to stretch your brain. Working with many models requires many of the packages of the tidyverse (for data exploration, wrangling, and programming) and modelr to facilitate modelling. To motivate the power of many simple models, we’re going to look into the “gapminder” data. This data was popularised by Hans Rosling, a Swedish doctor and statistician. If you’ve never heard of him, stop reading this chapter right now and go watch one of his videos! He is a fantastic data presenter and illustrates how you can use data to present a compelling story. A good place to start is this short video filmed in conjunction with the BBC: https://www.youtube.com/watch?v=jbkSRLYSojo. #> 1 Afghanistan Asia       1952    28.8  8425333      779. #> 2 Afghanistan Asia       1957    30.3  9240934      821. #> 3 Afghanistan Asia       1962    32.0 10267083      853. #> 4 Afghanistan Asia       1967    34.0 11537966      836. #> 5 Afghanistan Asia       1972    36.1 13079460      740. #> 6 Afghanistan Asia       1977    38.4 14880372      786. This is a small dataset: it only has ~1,700 observations and 3 variables. But it’s still hard to see what’s going on! 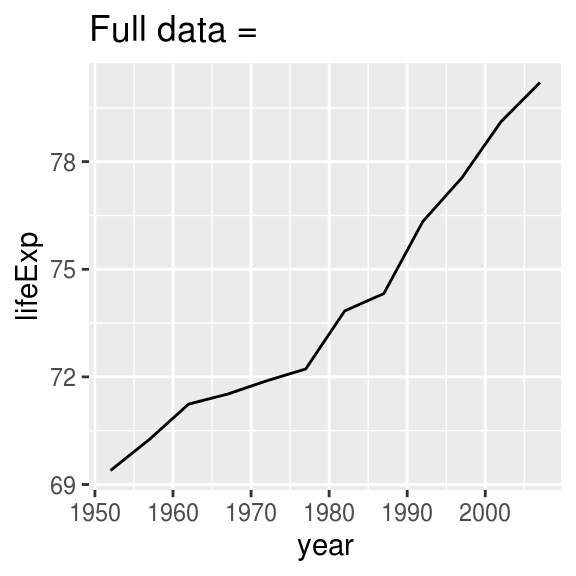 Overall, it looks like life expectancy has been steadily improving. However, if you look closely, you might notice some countries that don’t follow this pattern. How can we make those countries easier to see? 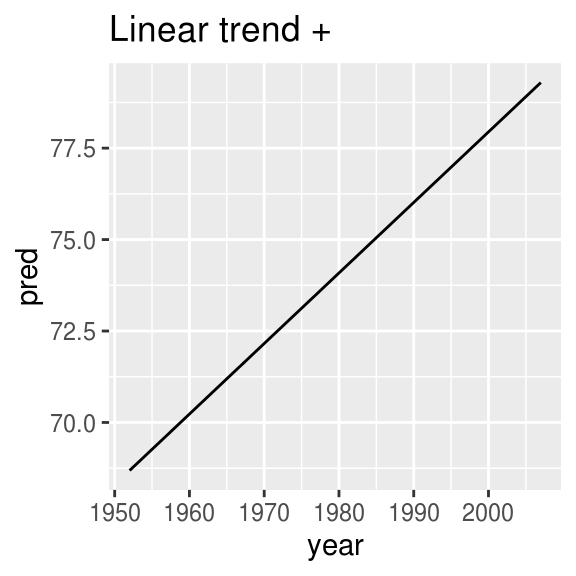 One way is to use the same approach as in the last chapter: there’s a strong signal (overall linear growth) that makes it hard to see subtler trends. We’ll tease these factors apart by fitting a model with a linear trend. The model captures steady growth over time, and the residuals will show what’s left. How can we easily fit that model to every country? This creates a data frame that has one row per group (per country), and a rather unusual column: data. data is a list of data frames (or tibbles, to be precise). This seems like a crazy idea: we have a data frame with a column that is a list of other data frames! I’ll explain shortly why I think this is a good idea. The data column is a little tricky to look at because it’s a moderately complicated list, and we’re still working on good tools to explore these objects. Unfortunately using str() is not recommended as it will often produce very long output. But if you pluck out a single element from the data column you’ll see that it contains all the data for that country (in this case, Afghanistan). #> 1  1952    28.8  8425333      779. #> 2  1957    30.3  9240934      821. #> 3  1962    32.0 10267083      853. #> 4  1967    34.0 11537966      836. #> 5  1972    36.1 13079460      740. #> 6  1977    38.4 14880372      786. Note the difference between a standard grouped data frame and a nested data frame: in a grouped data frame, each row is an observation; in a nested data frame, each row is a group. 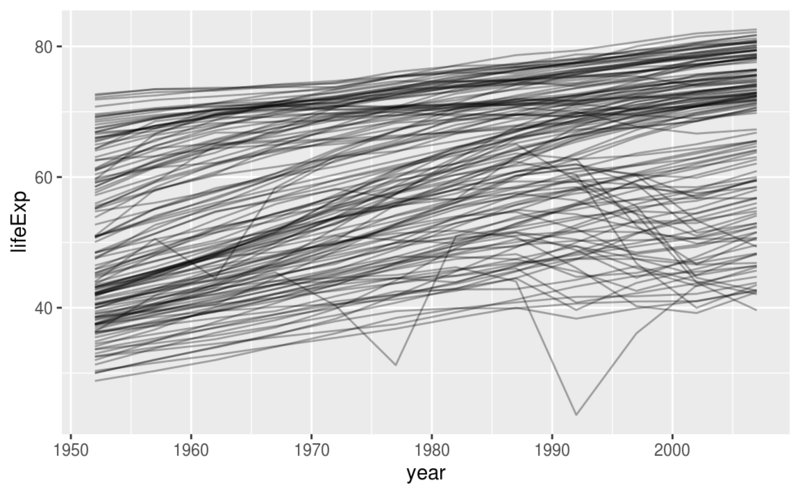 Another way to think about a nested dataset is we now have a meta-observation: a row that represents the complete time course for a country, rather than a single point in time. However, rather than leaving the list of models as a free-floating object, I think it’s better to store it as a column in the by_country data frame. Storing related objects in columns is a key part of the value of data frames, and why I think list-columns are such a good idea. In the course of working with these countries, we are going to have lots of lists where we have one element per country. So why not store them all together in one data frame? If your list of data frames and list of models were separate objects, you have to remember that whenever you re-order or subset one vector, you need to re-order or subset all the others in order to keep them in sync. If you forget, your code will continue to work, but it will give the wrong answer! Note that each regular column is repeated one for each row in the nested column. It looks like we’ve missed some mild patterns. There’s also something interesting going on in Africa: we see some very large residuals which suggests our model isn’t fitting so well there. We’ll explore that more in the next section, attacking it from a slightly different angle. We see two main effects here: the tragedies of the HIV/AIDS epidemic and the Rwandan genocide. 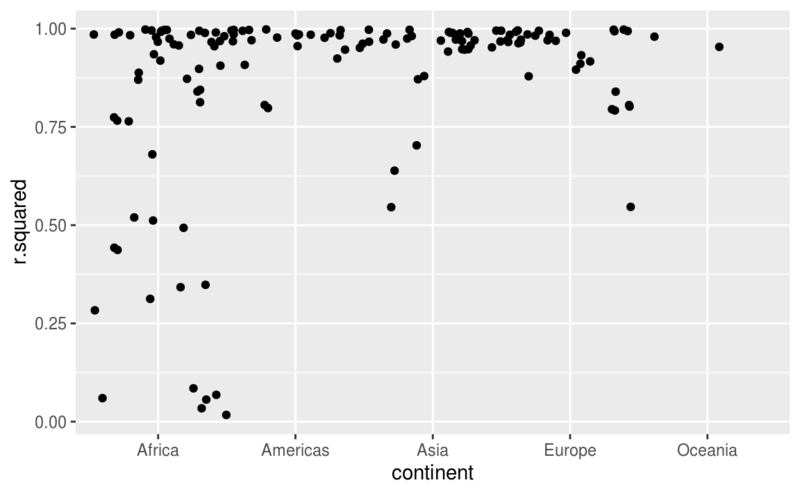 Explore other methods for visualising the distribution of \(R^2\) per continent. You might want to try the ggbeeswarm package, which provides similar methods for avoiding overlaps as jitter, but uses deterministic methods. 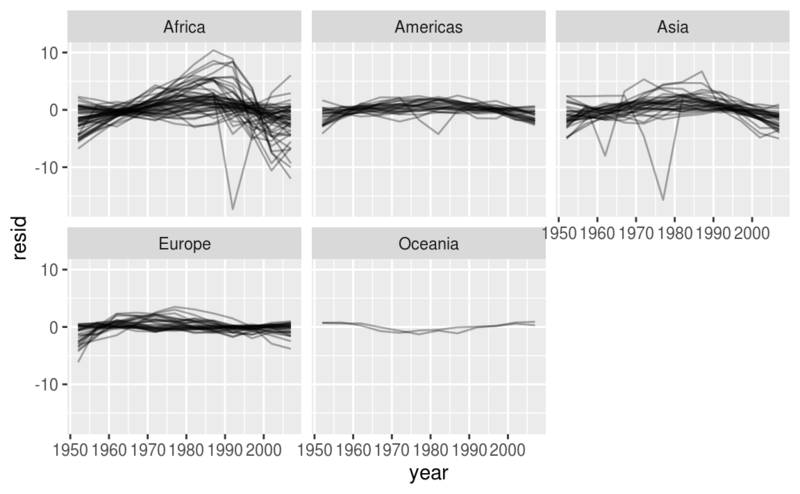 To create the last plot (showing the data for the countries with the worst model fits), we needed two steps: we created a data frame with one row per country and then semi-joined it to the original dataset. It’s possible to avoid this join if we use unnest() instead of unnest(.drop = TRUE). How? Now that you’ve seen a basic workflow for managing many models, let’s dive back into some of the details. In this section, we’ll explore the list-column data structure in a little more detail. It’s only recently that I’ve really appreciated the idea of the list-column. List-columns are implicit in the definition of the data frame: a data frame is a named list of equal length vectors. A list is a vector, so it’s always been legitimate to use a list as a column of a data frame. However, base R doesn’t make it easy to create list-columns, and data.frame() treats a list as a list of columns:. List-columns are often most useful as intermediate data structure. They’re hard to work with directly, because most R functions work with atomic vectors or data frames, but the advantage of keeping related items together in a data frame is worth a little hassle. You create the list-column using one of nest(), summarise() + list(), or mutate() + a map function, as described in Creating list-columns. You create other intermediate list-columns by transforming existing list columns with map(), map2() or pmap(). For example, in the case study above, we created a list-column of models by transforming a list-column of data frames. You simplify the list-column back down to a data frame or atomic vector, as described in Simplifying list-columns. With tidyr::nest() to convert a grouped data frame into a nested data frame where you have list-column of data frames. With mutate() and vectorised functions that return a list. With summarise() and summary functions that return multiple results. Alternatively, you might create them from a named list, using tibble::enframe(). Generally, when creating list-columns, you should make sure they’re homogeneous: each element should contain the same type of thing. There are no checks to make sure this is true, but if you use purrr and remember what you’ve learned about type-stable functions, you should find it happens naturally. nest() creates a nested data frame, which is a data frame with a list-column of data frames. In a nested data frame each row is a meta-observation: the other columns give variables that define the observation (like country and continent above), and the list-column of data frames gives the individual observations that make up the meta-observation. (If you find yourself using this pattern a lot, make sure to check out tidyr::separate_rows() which is a wrapper around this common pattern). Note that technically sim isn’t homogeneous because it contains both double and integer vectors. However, this is unlikely to cause many problems since integers and doubles are both numeric vectors. You can however, wrap the result in a list! This obeys the contract of summarise(), because each summary is now a list (a vector) of length 1. Data frames with list-columns provide a solution to a common problem: what do you do if you want to iterate over both the contents of a list and its elements? Instead of trying to jam everything into one object, it’s often easier to make a data frame: one column can contain the elements, and one column can contain the list. An easy way to create such a data frame from a list is tibble::enframe(). The advantage of this structure is that it generalises in a straightforward way - names are useful if you have character vector of metadata, but don’t help if you have other types of data, or multiple vectors. List all the functions that you can think of that take a atomic vector and return a list. Brainstorm useful summary functions that, like quantile(), return multiple values. What’s missing in the following data frame? 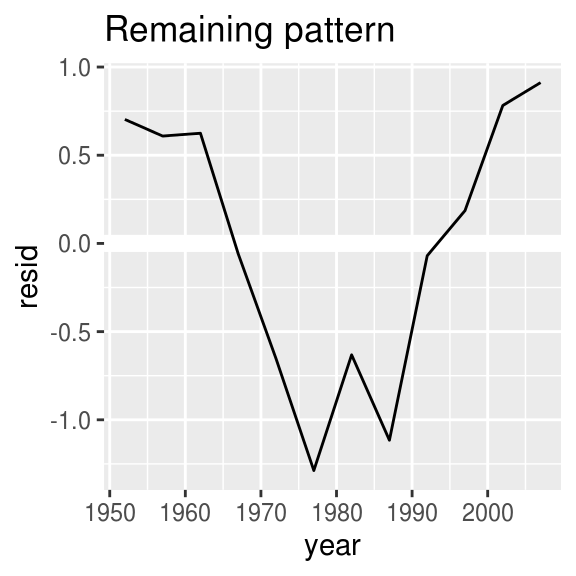 How does quantile() return that missing piece? Why isn’t that helpful here? What does this code do? Why might might it be useful? If you want a single value, use mutate() with map_lgl(), map_int(), map_dbl(), and map_chr() to create an atomic vector. If you want many values, use unnest() to convert list-columns back to regular columns, repeating the rows as many times as necessary. This is the same basic information that you get from the default tbl print method, but now you can use it for filtering. This is a useful technique if you have a heterogeneous list, and want to filter out the parts aren’t working for you. #> Error: All nested columns must have the same number of elements. The same principle applies when unnesting list-columns of data frames. You can unnest multiple list-cols as long as all the data frames in each row have the same number of rows. Why might the lengths() function be useful for creating atomic vector columns from list-columns? List the most common types of vector found in a data frame. What makes lists different? broom::glance(model) returns a row for each model. Each column gives a model summary: either a measure of model quality, or complexity, or a combination of the two. broom::tidy(model) returns a row for each coefficient in the model. Each column gives information about the estimate or its variability. broom::augment(model, data) returns a row for each row in data, adding extra values like residuals, and influence statistics.